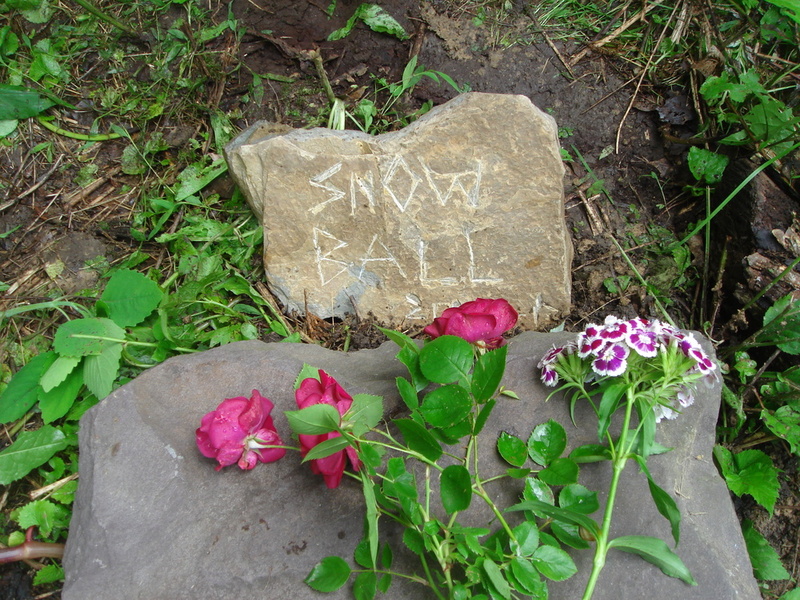 Two days ago our dear sweet cat Snowball died and I explained to my daughter how much we look at death from our human perspective. The regret and sadness and ensuing emotional heaviness in the chest all come from two things: Our "word world," and a doubt that our existence could be more than just a once-and-never-again-opportunity to appear on earth, which of course causes a massive fear of death. Existing in a "word world" enables us to live with awareness of the past and projecting into the future, instead of living in the present, as animals do (and as we did pre-language). We look back and remember, we compare it to the present loss, and translate it into future loss. But the feeling of loss is one-sided because the transiting animal perceives the process totally differently. Animals are different from us because of their present-oriented consciousness and inability to reflect (although meditation and mindfulness teach us to enjoy fleeting moments of being in the moment- also see previous post on "Now" and previous post on "wordlessness"). I recently read a very helpful description of an animal's death in Martha Beck's Finding Your Way In A Wild New World. Beck reminds us that "...we suffer more from our thoughts about events than from the events themselves. Detaching from our verbal thoughts eliminates almost all our psychological suffering." Here is Beck's description of watching an antelope being killed by a leopard, how she connected with the animal and understood the death process on a different level: "...The impala's always Wordless awareness is filled with shock and confusion, but absolutely none of the thought-based fears that make my own mortality so frightening to me. I'm struck by the lack of resistant ideas, like 'This shouldn't be happening!' or 'I'm not ready to die!' or 'My loved ones will be devastated!' There's just awareness of the strangeness of the situation and disorientation. Then it feels for all the world as though the impala senses my compassion for it. The animal seems very relieved to find someone caring about it, joining with it. I project all the calm and peace I can. Then I feel a gentle whoosh, and an incredibly sweet sensation of delicious, liberating expansion........Dropping back into language, I can clearly see that the leopard killed the impala. Then I immediately find truth in the opposite statement: I could just as easily say the leopard 'lived' the impala, taking its stored physical energy into her own body. Holding these opposites in my verbal mind, I feel language create a strange loop, pushing me beyond paradoxical belief structures and putting me smack-dab back into Wordlessness." "Death is the stripping away of all that is not you.The secret of life is to 'die before you die' - and find that there is no death."